I promised uber-busy and dynamic Filipina marketing consultant, Grace Hufano-Labaguis, in the New York/New Jersey area that I would spread the word about the July 25 concert featuring Journey’s Arnel Pineda, GMA Pinoy TV’s Rachelle Ann Go, and Ammo Band in Atlantic City. 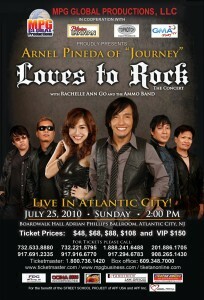 This musical journey on Sunday, July 25, 2010 at Atlantic City’s Boardwalk Hall Adrian Phillips Ballroom at 2:00 pm is a chance to see “Arnel Pineda Loves To Rock” before Arnel goes on another world tour with JOURNEY. I had never researched much about Arnel Pineda because I relied on the editorial skills of my Filipinas Magazine colleagues. In the meantime, I was fascinated by Rachelle Ann Go’s singing technique, wherein she modifies her aerial performance “brand” with subliminal influences from the likes of musical luminaries, Pink and Alicia Keys. Here is what Grace sent me. Enjoy! Here is a video of Arnel Pineda during the Grand Coronation of the 2010 Binibining Pilipinas contest.